Super Pacman presents a radical departure from the basic gameplay of its illustrious predecessor. While you still control the yellow hero, you no longer have to simply eat dots. Now you have to eat various fruit and treats. These are also located behind locked doors and you must collect the keys on the maze to open the door. This means you can easily get trapped if you only collect the key opening the entrance while not collecting the key to open the exit to the section. There are two types of powerpill this time as well. 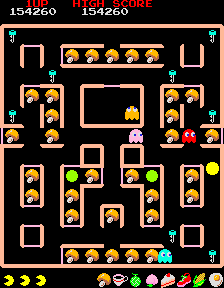 The yellow powerpills have the normal effect, that Pacman can eat the pursuing ghosts. There are also green powerpills which temporarily increase Pacman's size and speed. Pacman is all powerful when pumped up with both powerpills and he can also smash open the doors without collecting the keys. You must collect all of the fruit/treats and powerpills to clear the screen, but you do not have to collect all of the keys. 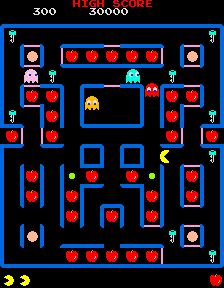 At the midpoint of each screen a bonus star appears in the centre of the maze, and the two blocks either side of it contain other changing bonus items. If you collect the star you score extra points, but if you collect it when the two changing bonus items match exactly you score extra. Stages 3, 7 and 11 are bonus screens. There are no ghosts to avoid; you must simply collect all the fruit/treats and powerpills before the bonus timer in the centre of the screen reaches zero. Achieve this and you score the points remaining on the timer. The items you have to collect on each stage are worth 10 points each x the level. They repeat after stage 16, but the score for each item still increases past 160. You start with three lives and extras are awarded at 30,000 and every 100,000 points. Apple: 10 points, Banana: 20 points. Doughnut: 30 points, Hamburger: 40 points. Fried Egg: 50 points, Corn Cob: 60 points. Shoe: 70 points, Cake Slice: 80 points. Toadstool(? ): 90 points, Pineapple: 100 points. Coffee Cup: 110 points, Mushroom: 120 points. Bell: 130 points, 4-Leaf Clover: 140 points. Galaxian: 150 points, Present: 160 points. Try to group the ghosts together, and lure as many as possible at once behind you before collecting a powerpill (3,000 for all 4 monsters). Note that you can kill the ghosts in their home, so on the early stages you can kill all 4, then collect another powerpill and kill them in their base as soon as they regenerate. This gives you another few seconds breathing space as well. At the early parts of each level, concentrate on picking up as many keys as possible before collecting any treats. This way you open up a lot of the maze, saving grief later on. When you are fully powered up, collecting a normal powerpill extends your powerup time. The super power does last longer than a normal powerpill. When you are fully powered up, try and break through any remaining doors to save you from having to collect all the keys. Don't worry about the bonus star in the centre - it's not worth wasting time waiting to try and match the items as you score far more points in general play on later levels. 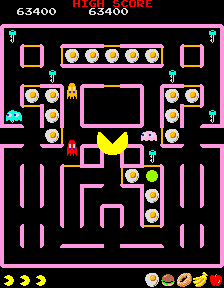 Although the maze layout is always the same, the keys on later levels open different doors, so you can't rely on the same patterns on each screen.